If tennis is your game and Bali is your holiday hotspot, then it just makes sense to book a fabulous villa sporting its own tennis court so that you can get your games in without having to leave your private island sanctuary. We’ve put together a list of some of the most elegant holiday properties on the island that have their own tennis courts where you can get your fill of fresh air, sunshine, and superb serves. Perched on the edge of a cliff overlooking the ocean, Bayuh Sabbha is a gorgeous 5-bedroom property featuring charming pavilions designed with traditional Balinese elements like thatched roofs and teak wood, all connected by limestone pathways that wind through tropical gardens. Convening with nature is part of the experience here, as there are beautiful open-air living and dining areas, two pools, a tennis court, outdoor kid’s play area, and even a wedding bale at the edge of the cliff overlooking the ocean. 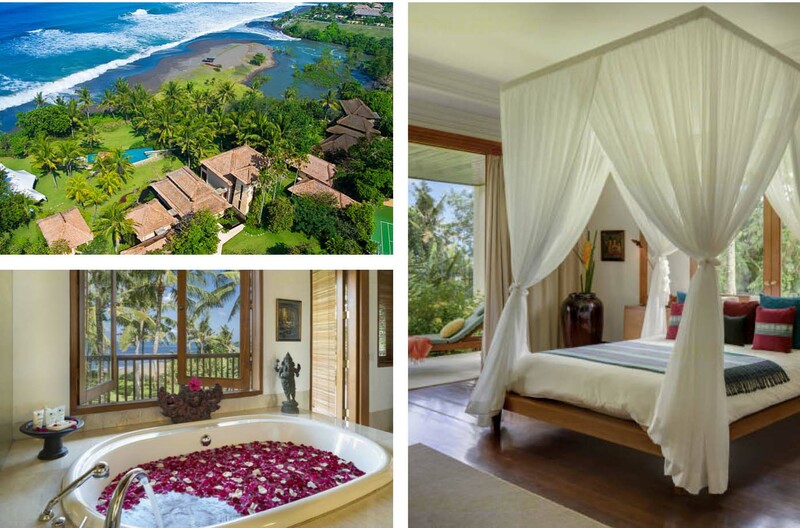 Outdoors types will love Villa Arika, a peaceful 4-bedroom retreat set on a private black sand beach in Canggu. The pavilions here are light and airy and adorned with natural wood and stone, silk cushions, and contemporary artworks. The infinity-edge pool takes centre place amid green lawns and swaying palm trees, and the regulation size tennis court just begs for early morning and late afternoon games. 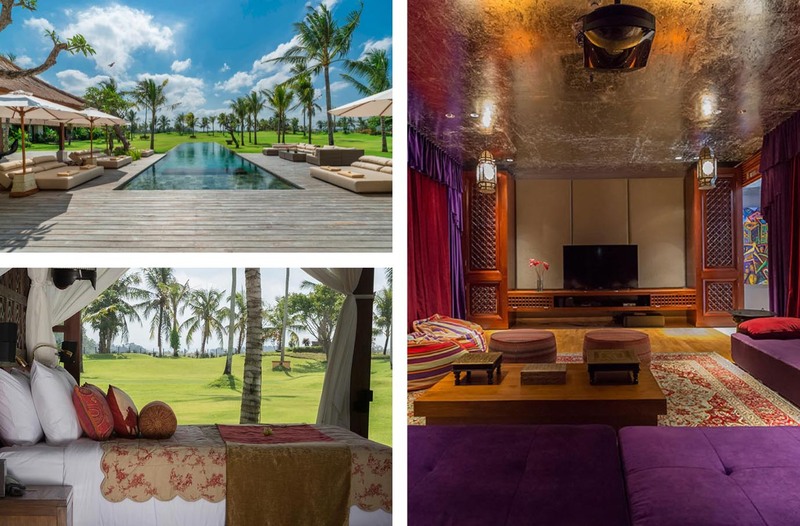 For large groups, you can’t do much better than Kaba Kaba Estate, a luxurious 8-bedroom villa with rolling green lawns that seem to spill into the rice paddies surrounding the property. Start your day with a gourmet breakfast overlooking the shimmering pool before heading to the tennis court for a friendly morning match. After the game you can soothe your sore muscles at the spa, take a dip in the pool, relax in the Moroccan themed media room, or chill out with a refreshing drink at the rooftop bar and terrace. Pantai Lima Estate is a collection of five different villas, each with their own unique characteristics and vibe. The property rests on a nearly deserted beach fringing the Indian Ocean, which means you get plenty of fresh sea breezes while playing tennis on the shared court. There is also a gym and seminar room available to all guests. You can rent each villa individually to enjoy your own private pool, Jacuzzi, lounging and dining areas, and spacious bedrooms, or book out the whole property for the party of a lifetime. 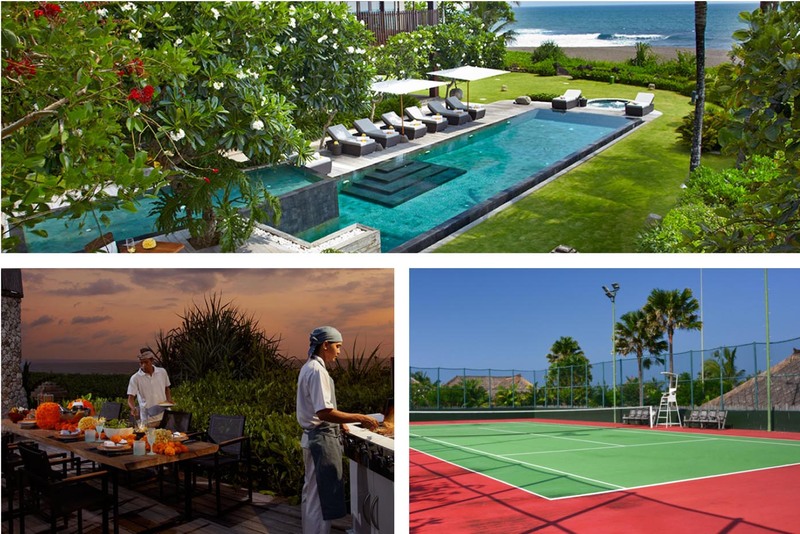 Explore our Bali Luxury Villas collection to find more tennis villas for your ultimate Bali holiday.